This week’s review is a recently released cigar that I have just been dying to get my hands on. Padron’s Family Reserve 46 Years Maduro. These cigars came in a recent order that I made with the absolutely awesome team over at Bonita Smoke Shop. 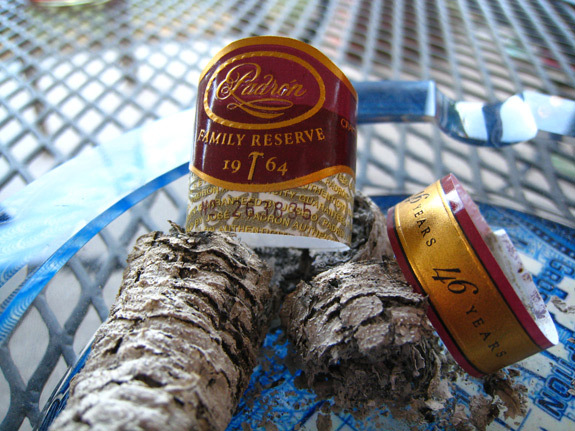 There you can find the Padron Family Reserve 46 Years in both singles and by the box. Padron isn’t a brand that I smoke too often. It’s not that I do not enjoy them (cause god knows I do), I just find them slightly out of my price range. 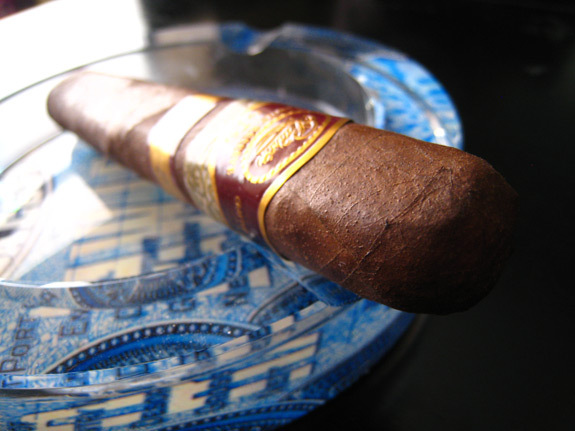 To me, Padron signifies the perfect “special day” or celebratory cigar. What am I celebrating? Being alive I guess. I just really wanted to see just how great of a chance this years 46 Year release has for Cigar of the Year vs. last years 45 year release. The Good Stuff: The Padron Family Reserve 46 Years Maduro is said to be amongst the most finest cigars that have ever been produced by the Padron Family. 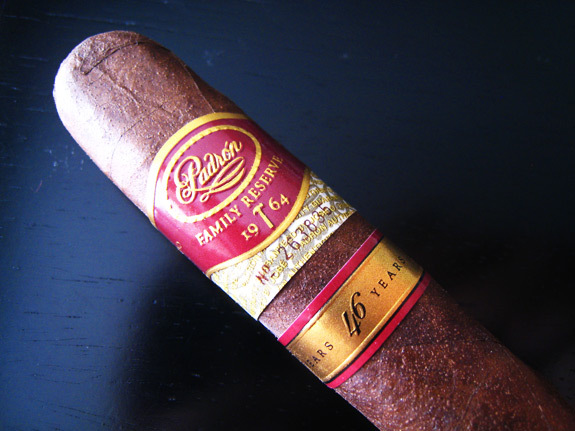 The 46 year Family Reserve is made to commemorate Padron’s 46 years of successful operation. The blend is composed of all Nicaraguan tobacco grown at Padron’s Tabacos Cubanica factory in Esteli that is aged for at least 10 years (some of the companies oldest tobacco). The 46 Years only comes in a maduro wrap unlike the previous 45 Year blend which came in both Maduro and Natural. There have been rumors going around that Padron plans on releasing the blend in a natural wrap but again, these are only rumors. The Padron Family Reserve 46 Years comes in boxes of ten and there will only be between 40 to 50 thousand of these cigars made. 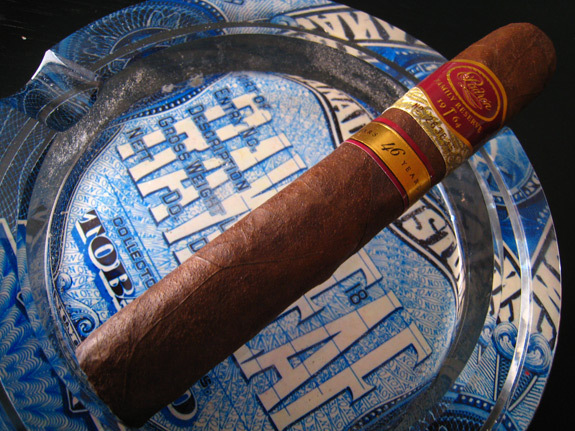 Prelight: The Padron Family Reserve 46 Years Maduro is a very meat, beefy, boxed pressed maduro. The wrapper is a very consistent, toothy, dark chocolatey brown wrap that leads up to a single, tiny, flawless cap. 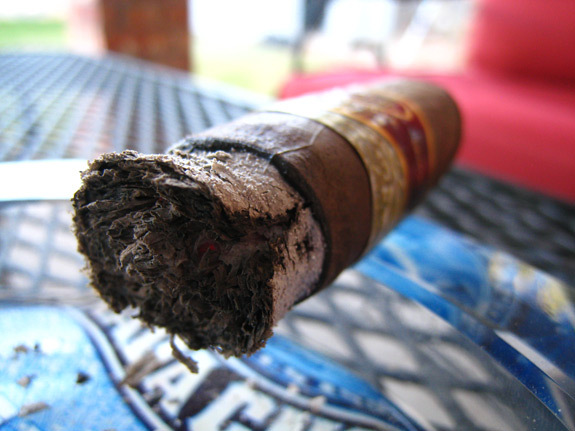 This cigar is very heavy, and extremely firm to the touch. 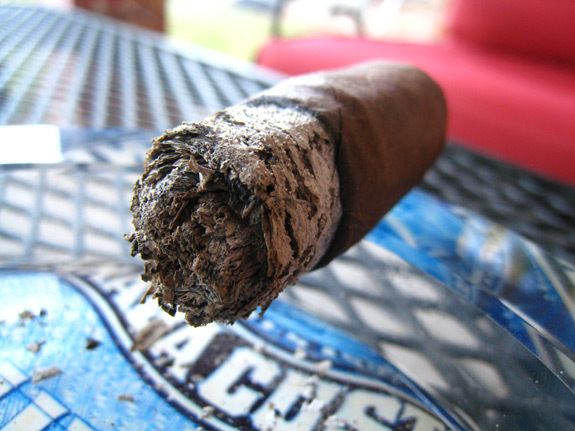 There no soft spots, and just one small section on the side of the cigar towards the middle of the body that bumps out. The wrapper on this cigar seems really tough and durable. It’s real tough and I am only hoping that is isn’t a branch and I burn right through it. The band is exactly what you would expect from the Padron Family Reserve line. Dark maroon with the words “Padron – Family Reserve – 1964” embossed in gold metallic ink. The underband simply states the number of authenticity, No. 263835 in this case. The finally band is small color reversed band with the words “46 Years” repeated across it. The wrapper gives off but a faint chocolate and coffee aroma while the boasts of a very smooth and creamy espresso with subtle hints of natural tobacco. The 46 Years cut off very lean and easy using my double bladed cutter. 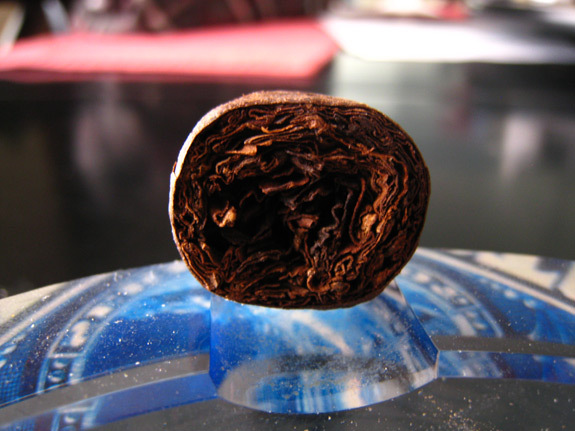 The cold draw produces a very flavorful tobacco and cocoa mixture with a bit of coffee. First Smoke: The Padron 46 Years starts off by pumping out just a massive and effortless draw. 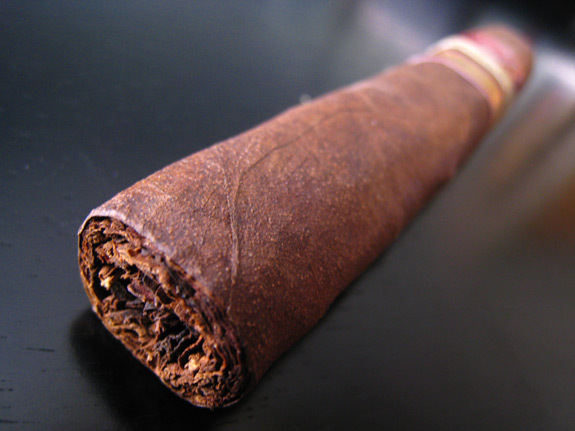 This cigar pumps out a very thick cedar rich draw with hints of espresso, spice, sweetness, and chocolate. After the first couple of puffs a very strong spice (nutmeg and cinnamon maybe?) just takes over this experience. Leaving behind a completely massive cloud of thick, lingering smoke. This cigar gives off a very impressive amount of spicy scented stationary smoke. 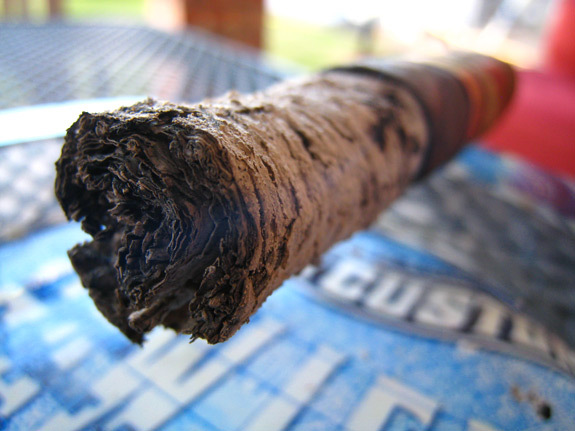 The burnline is extremely sharp and dead even all the way around the body of the cigar. The ash left behind is a brilliant grey, almost white, and held on literally for two inches before falling into my ashtray. Halfway There: I really live this size of this cigar. Not to big, not too small, and the box press fits perfectly and comfortably between your fingers. The spice into the second third simmered down a bit and the cedar flavor made it’s triumphant return. There is still quite a bit of espresso mixed in there as well. So far the experience has been flavorful, creamy, and incredibly smooth. I can’t feel any nicotine despite how slow this cigar is burning. The retro hale is straight up woodsy and I get almost the same prime just being around the cigar due the amount of stationary smoke the 46 year gives off. On a side note, The “bump” mentioned in the Prelight did nothing to hinder the experience. I just burned right through it. Finish: I have to say, the Padron 46 years is a perfectly balanced yet complex cigar. The final third while flavorful, finished incredibly smooth. The spice has been completely removed from the flavor make-up with only the cedar and lingering espresso and chocolate flavors. I still haven’t felt much nicotine from this cigar. It fits perfectly in the medium range finishing smooth and creamy with no harshness built up what so ever. The cigar didn’t even burn hotter than warm going well within the final inch. The burn was perfect from start to finish with no touch ups or relights needed. On another side notes the small band peeled right off while the larger two connected bands slight off with ease. Overview: After all was said and done the Padron Family Reserve 46 years took about an hours and forty five minutes to finish. And I have to say I enjoyed every single minute of it. Super flavorful, complex, creamy, mild and smooth. Everything you would expect from the Padron Family. Will it top last year’s Cigar Aficionado’s best cigar of the year performance? No idea, but I can say it stands a few good chance. The price obviously plays a big role in me saying that I don’t find these cigars in my regular rotation too often. At around $26 a pop this cigar is a bit pricey. It is however the perfect special day or celebratory cigar. Pairing: I hit the booze hard last night so I didn’t do my normal beer/wine pairing with this cigar. Instead, pure hydration. H2O was my weapon of choice. Needless to say I ‘m not posting a picture of this. You all should know what water looks like. 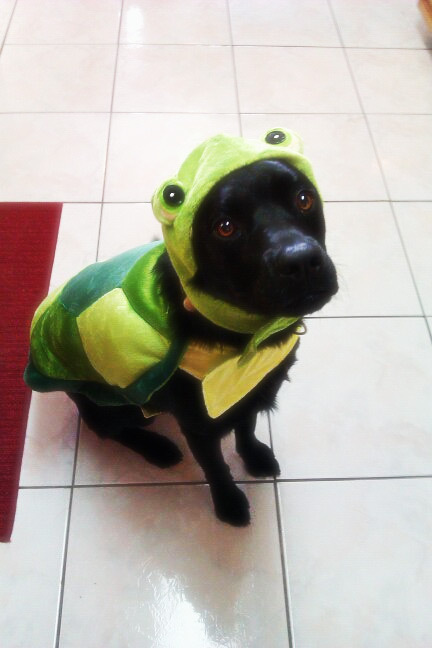 Instead, I am posting a picture of my dog Sonny in his Halloween costume. Cause he’s a badass and keeps me company while I write these reviews. Hey Tony, great review! I got a box of these, yesterday and haven’t tried one, yet. I will be looking forward to my first smoke! Thanks for the review, Tony. I have one sitting in my humidor…can’t wait to smoke it! At $26 a piece, I agree that these are to be saved for a special occasion. Nice looking dog, by the way. JR – you are a lucky man. Hop ya enjoy them! Chris – Get to smoking! Victor – Honestly though, I’d take Padron of Opus anyday 🙂 I’m sure Albert won’t be happy to hear that. Great review Tony! How do you think it compares to the 45th maduro! I’m really looking forward to trying this one. Thanks Keith, I think they are both pretty much on par with one another. Which should make for a great stetch down to this year’s title! Andy, you never know sir! Great review. The 44 and 45 are excellent cigars. I cannot wait to try the 46. TIM! Glad to see ya on here man! The 46 makes for a perfect extension to the Reserve line. Get your hands on it, you’ll like it! Nice review. I’m gonna save up a few coins and find a special occasion to smoke one of these. You’ll def enjoy it bro! Thanks for the read dude! Great review. And an excellent stick. I have really enjoyed this one.